Important research funded by Cardiac Risk in the Young (CRY) is adding further weight to the argument that proactive cardiac screening is a cost-effective way of saving young lives. By using the screening criteria developed by CRY (the so-called, “CRY-teria”) the number of false positives will be significantly reduced – resulting in a staggering 21% reduction in the cost of heart screening and follow-up tests for young people. The paper published in the prestigious medical journal, JACC (Journal of the American College of Cardiology*) shows that the UK National Screening Committee’s fears of false-positive rates and the cost of additional investigations should not be seen as an obstacle to the widespread implementation of electrocardiographic (ECG) screening of young athletes for cardiac disease – particularly at a grassroots level. As part of the study, 4,925 previously unscreened athletes aged 14 to 35 years were prospectively evaluated from 2011–2014 with a medical history, physical examination and ECG (interpreted with the 2010 ESC recommendations). Compared to the 2010 ESC recommendations, the refined criteria would have resulted in 50% reduction in the number of echocardiograms, 12% reduction in the number of exercise tests, 8% reduction in Holter monitors, and 18% reduction in the number of cardiac MRI scans that would need to be performed to confirm (or refute) the diagnosis of cardiac disease. 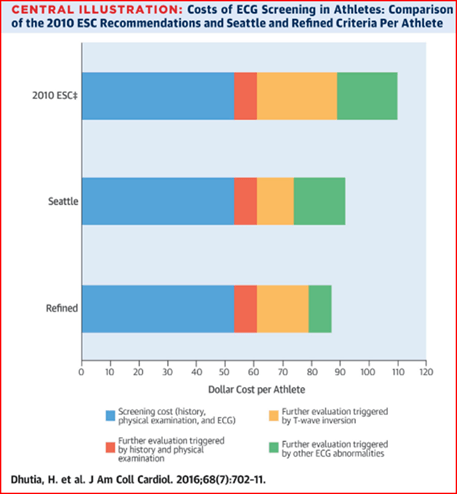 Consequently, screening with the refined criteria translates to a 21% cost reduction of cardiovascular screening2 of young athletes without compromising sensitivity to detect serious disease. Indeed, 15 (0.3%) of the athletes were diagnosed with potentially life-threatening cardiac disease using all 3 criteria. Since CRY was founded in 1995 CRY has tested over 100,000 young people, resulting in 100s of potentially life-threatening conditions being identified – both among elite athletes and general public. Professor Sanjay Sharma, CRY’s Consultant Cardiologist is the leading Sports Cardiologist in the UK, and recognised as one of the leading experts for young sudden cardiac death worldwide. He makes no charge for supervising the CRY screening programme so due to this support CRY is able to significantly subsidise the programme (costing between £35 and £50). Privately these tests could cost many hundreds of pounds. He adds; “Through our pioneering screening programme, CRY’s research teams have unrivalled access to clinical data that is allowing us to further international understanding of the causes of young sudden cardiac death in both athletes and the general population as well as developing the most accurate and cost-effective way of identifying these potentially fatal and often preventable conditions. Any person between the age of 14 and 35 can book an appointment online and, in 3 clicks, can register to have a free cardiac investigation overseen by a specialist. www.testmyheart.org As CRY receives no government funding this is only possible because of the incredible support CRY receives from communities throughout the UK to provide this free service to the public.